The following describes the bylaws of the KY-LMSC. A PDF version of this document is available for download here, via the U.S. Masters Swimming website. The geographic boundaries of this LMSC shall include the state of Kentucky and Floyd and Clark Counties, Indiana. 1. Club: Four registered Masters swimmers may form a club as defined by USMS. A fee is to be paid to USMS Inc. to register the club through the KY-LMSC. 2. Team: Four registered Masters swimmers may form a team. A fee is to be paid to the KY-LMSC to register the team within the KY-LMSC. No person may be a member of more than one team at the same time. Members of registered teams shall be members of Swim Kentucky Masters club. USMS and KY-LMSC rules governing procedures for a member changing club registration shall apply to members changing team registrations. (b) A simple majority of selected representatives. Each registered Masters club and each registered KY-LMSC team is entitled to one representative. For each additional 30 registered swimmers, a club or team, as the case may be, is entitled to one additional representative. Each club or team shall decide its own method of selecting its representative(s). The KY-LMSC shall approve the number of representatives for each club and each team, which shall be determined by the number of registered swimmers for the previous calendar year. 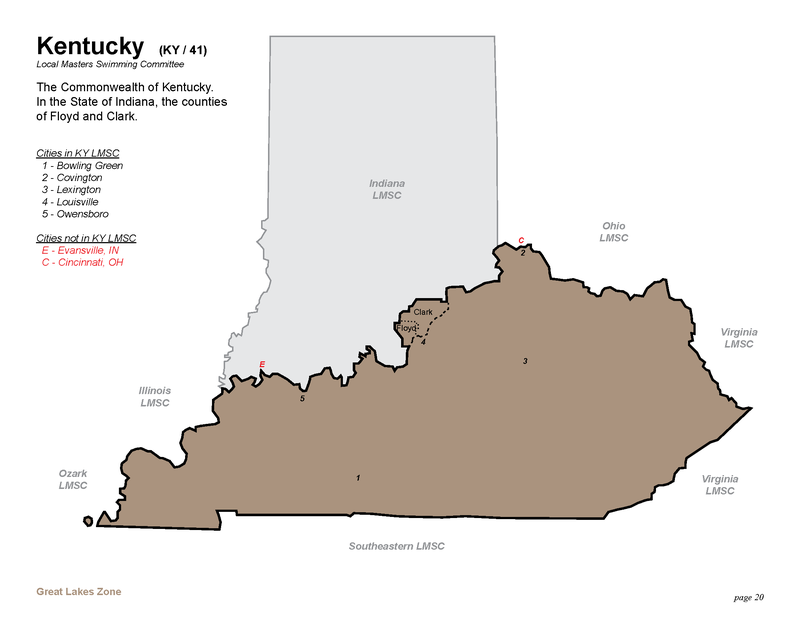 The KY-LMSC may select as many at-large members as it deems appropriate for its efficient operation. Officers and directors of United States Masters Swimming shall be at-large members of the KY-LMSC for as long as they hold their office. Representatives and at-large representatives shall have voting privileges. The KY-LMSC shall be entitled to receive a fee from each Masters swimmer. The fiscal year of the KY-LMSC shall be January 1 through December 31. The registration year of the KY-LMSC shall be November 1 through December 31 of the following year. Officers shall consist of a chair, vice chair, secretary and treasurer. The offices of secretary and treasurer may be held by the same person. The term of office shall be two years. The officers shall be elected at the annual business meeting in odd-numbered years by a majority of all voting representatives. Officers may succeed themselves. Officers shall be considered voting representatives of the KY-LMSC by virtue of their office, and are not required to represent their clubs or teams as delegates. Officers and directors of United States Masters Swimming are not eligible to be elected as officers of the KY-LMSC for the period in which they hold their office. CHAIR—shall call and preside at all meetings of the KY-LMSC and the Executive Committee. The chair shall create standing or ad hoc committees when necessary and appoint chairs of those committees. VICE CHAIR—shall act and preside as the chair in the absence or disability of the chair, and shall perform such duties as the chair may direct. SECRETARY—shall prepare and keep the official correspondence and files of the committee and take and report the minutes of all meetings called by the chair. The secretary shall also maintain permanent records containing names and current addresses of all registered Kentucky Masters swimmers, clubs and teams. TREASURER—shall collect, keep, disburse and invest the funds of the KY-LMSC and maintain all financial records. The treasurer shall present a yearly budget to the KY-LMSC before the beginning of each fiscal year. At the annual business meeting, the registrar shall report the number of registered Kentucky Masters swimmers for the immediate past fiscal year. The chair will declare the number of representatives from each registered club and each registered team, based upon the registrar’s report. Then the chair will recognize the incoming representatives selected by each club and each team. The representatives need not be present. This KY-LMSC will determine the number of at-large representatives to be selected for the current fiscal year. The new club and team representatives will select any new at-large representatives deemed necessary. The at-large representative(s) need not be present. After this time, this group shall become the new KY-LMSC. Election shall follow. Election of chair, vice chair, secretary and treasurer shall be held at the annual business meeting in odd-numbered years. The outgoing chair or designee shall preside over the election. There shall be nominations from the floor. Each representative of the KY-LMSC shall have one vote. The vote may be by a show of hands or by secret ballot, at the discretion of the KY-LMSC. A majority vote elects—with a quorum present. The term of office shall be two years. If there should occur a vacancy among officers of the KY-LMSC, the chair, with the consent of the remaining members of the Executive Committee, shall nominate a current representative of the KY-LMSC to fill the unexpired term of the vacated office. Registration, Top 10, Sanctions, Officials, Fitness, Safety, Mini-Meets, Newsletter, Records, Open Water, Grievances, Coaches. The chair shall charge each committee with its duties. The chair may appoint other committees on an ad hoc basis that are deemed necessary to carry out the duties of the KY-LMSC. The chair shall charge each committee with its duties. There shall be one mandatory annual business meeting held during the first four months of the fiscal year for the purpose of election of officers in odd-numbered years; to create a budget for the Executive Committee, which shall not exceed 25 percent of the KY-LMSC’s total assets as computed as of the first day of the fiscal year; and to conduct such other business as may come before the KY-LMSC. The annual meeting shall be scheduled by the chair, and all other meetings shall be called at the chair’s discretion. Notice of meetings is to be in writing (by either U.S. Postal Service or by electronic means) and sent by the secretary not less than 14 days before the date of the meeting. Motions shall be passed by a simple majority vote of those KY-LMSC members in attendance. In all other respects, Robert’s Rules of Order shall govern the parliamentary procedure of the meetings. The Executive Committee shall consist of the officers and any two chairs of standing committees, provided that no person shall take more than one seat on the Executive Committee. The two standing committee chairs shall be selected on an as-needed basis by the LMSC chair or designee. Meetings of the Executive Committee shall be called by the chair. The Executive Committee shall have authority to act for the KY-LMSC and to create policy between meetings. The KY-LMSC shall sanction any Masters event held within its boundaries. The Registrar or Top 10 chair shall report the final results of each event to Masters publications and the USMS national office. The registrar shall make the current address file or registrar’s records available to any member, club or team that is organizing an event. Amendments of these bylaws shall be made by a majority vote of the KY-LMSC at any general meeting. Proposed bylaw changes shall be received by each voting representative at least two weeks prior to the meeting. Upon dissolution, the net assets of the LMSC will not inure to the benefit of any private individual or corporation, but will be distributed to United States Masters Swimming Inc. to be used exclusively for educational or charitable purposes, or, if United States Masters Swimming Inc. is not then in existence, or is not then an organization exempt as a charitable organization under the Internal Revenue Code of the United States, as amended, and to which contributions, bequests and gifts are deductible for income tax purposes, such assets shall be distributed to such a corporation, to be used exclusively for educational or charitable purposes.